When we first start working out we are inspired by someone or something, like a girl telling us we are too skinny or seeing an inspirational fat to fit story or its just a new years resolution. What ever your reason maybe, as newbies we rush into working out with out known what's what, all most of us know is what a bicep curl is and that is usually where we head to first when we join the gym. All we care about is getting big guns, because that's what we think working out is about. 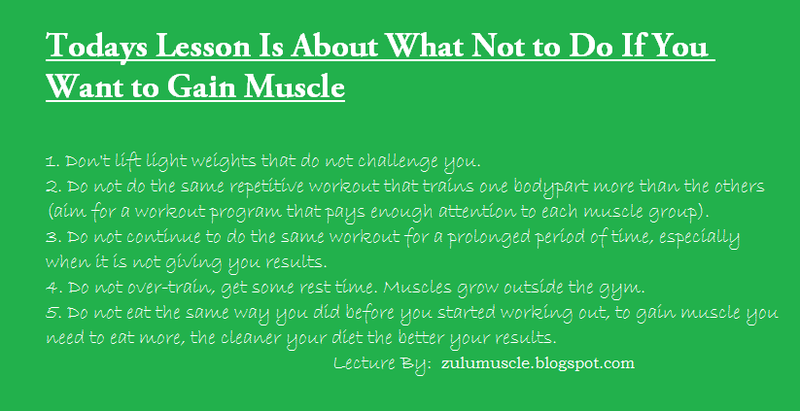 That is one of our very first mistakes when it comes to working out, I will share a few other mistakes underneath. - you do not have to try and compete with the big guys but atleast pick up a weight that challenges you, by that I mean a weight that you can handle with proper form but after a few sets and at the end of each set, you are struggling a bit. If a weight is too light your muscles will not grow because you are not providing enough stimulation. - if you want to grow your muscles you need to train each individual bodypart enough, for each day at the gym you could pair or dedicate that day for one body part e.g Monday is chest day, Tuesday is for arms and so on. This will make sure each body part has enough stimulation to grow and each muscle gets enough time to recover and grow. - after a while your body gets used to your routine and stops growing, what you need to do is find other exercises to stimulate that bodypart or always increase the weight and play around with your rep ranges, as long as you are not letting your muscles adapt to your routine, mix weights and body exercises, you can also add resistance training to provide variety. 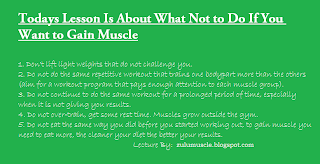 - if you are always going to the gym, doing too much cardio, not sleeping enough, all that will cause your muscles to not grow, because they do not have time to recover hence they will not grow (only break down, which you don't want). Your sleep cycle is important for muscle gain and whole body function, if your body is fully rested you will be stronger, have more energy and recover faster. Have you seen long distance runners thats the kind of body you are building if you do too much cardio, you want muscle so do some cardio but be careful not to do too much( do shorter interval training instead of long distance same pace jogs).